Developmental and development-oriented learning with digital media are discussed in relation to the concepts border crossings and multimodal composition. The first concept refers to a transveral of disciplines and recombinations of elements from them. Local-global relations in knowledge building are covered. The second refers to the collaborative construction of multiliteracies across media types and discourse modes. Three case studies relating to Zimbabwe are presented, one in fine arts and two in performing arts. A cultural historical activity theory frame is adopted. Analysis draws on expansive learning. As a whole multimodal discourse and activity theory may be enriched through study of students' production of mediating artifacts. This article is about three cases of student composition using a variety of media types and discourse modes. The cases relate to projects involving Zimbabwean students, both in Harare, Zimbabwe, and Oslo, Norway. In these cases, development is seen to have two senses: 1) developmental processes in student learning, and 2) student learning in development-oriented contexts, that is in 'developing' countries. This article attempts to draw together these two senses and to show that they may enrich one another, theoretically and practically. It does this by accessing two core concepts: border crossing and multimodal composition. With regard to developmental processes in student learning, I refer to border crossing in terms of students' engagement in experimental processes; by shaping digitally mediated art and performance works as mediating artifacts, and by communicating about those works academically. I use the term multimodal composition to encompass students' creative and critical constructions in fine and performing arts as part of their own emerging electronic multiliteracies. In the second sense of development, the article refers to how inquiry into the implementation of ICTs in learning involving Zimbabwean students has moved between two geographically remote countries, Zimbabwe in the 'south' and Norway in the 'north'. The material presented shows that perspectives, pedagogies and innovation may also move from their local genesis in a resource-strapped African higher educational and development setting to experimental works relating to Zimbabwe at a major university in one of the world's most technologically endowed countries. Three cases are presented 1 which may be seen as instances of how students' uses of ICTs may generate new knowledge for both themselves and for the research projects connected to them. The cases offer empirical evidence on ways in which experimental multimodal discourses may be built through student collaboration, via access to different media and modes of communicating, and in interdisciplinary partnerships. At a time of considerable political turmoil surrounding access to land in Zimbabwe, these student projects offer creative, constructive and culturally articulated contrasts to the self-destructive political policies about land redistribution in Zimbabwe. These student works show what it was possible to develop locally via a large project HyperLand, from which the first case on fine art is drawn. HyperLand had the overall goal of motivating and supporting students' critical investigations of representations and mediations of 'land' as part of their production-based learning about content, culture and ICTs. This approach was extended to the interplay of digital scenography in collaborative processes of choreographing and performing dance works. In all of these cases, students managed to locate and negotiate important cultural inheritances and traditions and to include them as meaningful resources in their own digitally-mediated learning. The three cases were each framed in a socio-cultural approach to learning (Vygotsky 1962, 1978; Wertsch 1991, 1995) within cultural historical activity theory (CHAT) in which students' agency and creative voices are important. In each case, students developed digitally-mediated artifacts through collaboration, via the uptake of new tools, as inscriptions of earlier practices and in the form of new expressions. The article argues that earlier notions and practices of composition from academic communication and rhetoric may be recast in an expanded learning frame (Engeström 1987, 2001). Here, student 'composition' may be seen to be moving from writing into experimental and emergent multimodal discourses. This may extend students' academic literacies (Johns 1998) to include a range of digital media types and discourse modes, that is as electronic multiliteracies. Learning through multimedia production (for example, Buckingham et al. 1995) is in a sense learning to 'write the technology' (for example, Haas & Neuwirth 1994) and thereby also a means of investigate changing meaning-making in expository and expressive discourses (Díaz-Kommonen 2002, 2003). Research questions related to the cases are covered in sections below on each case. The main research issue has been how to understand and analyse the intersections and differentiations of multiple participant roles and the various ICTs involved in collaborative, experimental student productions. 2 The next section refers to interdisciplinary inquiry by use of the concept border crossing. This is followed by a section on multimodal composition. Cultural historical activity theory is then covered. The three cases follow. A final concluding section discusses directions for multimediational and polyvocal composition. The metaphor 'border crossing' is now used by several disciplines in the Human Sciences as part of conceptualising subject-specific concerns over how knowledge is made and communicated (for example, Cohen 1999 on Anthropology). It also appears as part of the repertoire of reflexive methods in post-structuralist inquiry (for example, Chambers & Curti 1996 on Cultural Studies, Atkinson & Breitz 1999 on contemporary art in southern Africa). Earlier disciplinary distinctions and subsequent notions of multi-disciplinarity have been rephrased through the intersections of parts of disciplines resulting in transdisciplinarity. Transdisciplinarity has come to be framed in, through and as negotiations and translations. Here, 'border crossings' refers not only to the inclusion or importation of concepts from a related or distant field but to the ways in which knowledge may be formed through the linkages, convergence and recombinations of elements from and across different domains (for example, Seaman 2002 on visual poetics). Knowledge making is now acknowledged to be a process and not only directed towards the shaping of an end product. In this view, it is seen to be epistemically in a state of flux; creation and contestation, contradictions and shared resolutions are thus central to the making and analysis of multimodal composition. Border crossing is included here as part of a conceptual apparatus for investigating how multimodal digital compositions might be understood as multiply scored, arranged and performed - and by students. I refer to the empirical shaping of multimodal discourse in learning in fine and performing arts. This discourse is characterised by students' collaborative involvement in making multimediated texts of their own, that is both expository and expressive discourse. The student works are instances of voicing degrees of fluency with new tools; they are also instances of finding ways of applying digital tools to educational tasks and wider forms of enculturated expression in digital domains. This said, however, the article presents crossings which are not often mentioned in the numerous studies on ICTs and learning. This refers to both teachers and students moving between and across two geographically remote countries with varying cultural, technical and educational contexts. Border crossing is used to point to ways in which student learning may be realised through local, culturally situated articulation in which students' own compositions are paramount and where local is not seen to be culturally isomorphic with geographical place. The three cases each refer to connnections between Zimbabwe and Norway; both Harare (fine art with hypermedia), and Oslo (mediated scenography with choreography), however, may be seen as local contexts for collaborative, multimodal composition. Multimodal discourse has become a vogue term in the past few years, often informed by the work of Kress and van Leeuwen (2001). Their approach has been applied largely to school-based and informal learning. Relatively little use has been made of their core concepts in in the form of student authoring or composition with ICTs in higher education. The 'digital discourse' to which this article refers is that generated through student 'composition'. Academic writing may be supplemented in learning through and by communicating in a variety of modes - drawing, video, dance and animation (Bolter 1998). Attention to such modes in shaping multiliteracies (Kress 2003) takes place through collaboration involving working with the known and the familiar, but also the uncharted and risky. Here, multimodal composition refers to learning to make multimodal discourse in which there is a convergence of tools, content and culture (for example, Myers et al. 1998, Wysocki 2004). In order to draw together these lines of argument, I refer to the notion of multiple electronic literacies or, as I have termed them, electracies (Morrison 2001, 2003a, 2003b). I developed the term electracies to refer to a compendium of literacies in higher education, beyond written communication (for example, Ulmer 1997, 1998), which may be combined to generate new forms and practices (Johnson-Eilola 1997, New London Group 2000). 3 These literacies are multimodal: they demand our ongoing work and competence with a range of software and systems, they may include still and moving images, illustrations and texts written for screen spaces, to mention a few. Buckingham and Sefton-Green (1997) point to the need to look at expanded notions of media literacy in media studies. Wysocki and Johnson-Eilola (1999) remind us however, that we should be wary of using literacy as a metaphor to account for all that takes place in learning with new technologies. Traditional pedagogy in higher education does not typically encourage process-based experimentation with new genres, forms and expressions through and as multimediated communication. Each of the projects presented below took a specific experimental stance, yet was contextualised within in an explicitly situated approach to learning (Lave & Wenger 1991). This was to adopt an explicitly investigative, experimental approach to learning with technologies that motivates and encompasses curiosity on the part of Humanities students (for example, Green 1995). In terms of collaboration, though, art, design and performance studies offer a medley of modes of communicating which may be usefully added to and combined in our changing, yet often written, electronic discourses. In short, this is to look into ways of building an expanded communicative repertoire. Cultural historical activity theory (CHAT) is adopted as an overarching conceptual framework (Engeström 1999a, Engeström & Miettenen 1999) for the analysis of these three cases. It offers some means of critically mapping and understanding how the changing terrain of expository and expressive literacies may be inscribed as part of pedagogies in higher education. Although participation is central to such an approach, activity theory provides a powerful multi-level conceptual apparatus for getting at the role of technology as a mediating tool which helps facilitate expansive cycles of learning. Expansive learning is one approach within CHAT which pays attention to the dynamics of cycles of transformation (Engeström 1999b). It will be presented and then applied to the three cases.In the knowledge creation framework of CHAT, collaboration is that "... process mediated by shared objectives on which the participants are working" (Lipponen et al. 2004, p.41). For these researchers, what defines creative collaboration is its focus on "...certain shared objects, knowledge-laden or conceptual artifacts and the agents' relationships to them" (ibid). CHAT sees the activities of learning as occurring in a context and a community. In this context, the subjects' actions are influenced by rules and roles. Through intersecting with dynamic relationships with divisions of labour and the functioning of mediating artifacts and tools, additional activities or artifacts may result, that is as outcomes (Engeström et al. 1998). A socio-cultural approach to learning focuses attention on what participants actually do within a communicative process and the ways in which their compositions or mediating artifacts may be understood contextually. In a socio-cultural view, the 'meaning potential' of language and social semiotic approaches to communication, learning and composition (for example, Halliday 1996; Halliday & Hasan 1985; Kress 1998, 2003) may be seen as more than the collaborative construction of an activity. As the cases below illustrate, this is also about how such compositions, and indeed their experimental character, may be viewed in terms of their cultural significance, that is interpersonally and institutionally. This is to accentuate that learning to compose is a situated, shared activity that also needs to be contextualised and yet remain tentative and open to change as part of ongoing learning with and through ICTs. In the formulation of what is called a third generation of CHAT, a number of key features have now been identified: cultural diversity, multivoicedness, dialogue, macro-level networks, networks of activity and boundary crossing.4 Boundary zones refer to what lies and is constructed between different, intersecting systems of activity. Such 'crossings' may be understood in terms of 'motives'. Interest is also in collective artifacts, that is in their shared making and interchange. Artifacts are seen as multiple and multiply mediated. How such shared and situated knowledge comes to be achieved may be studied less by seeing developmental change on a vertical axis, but rather in terms of its horizontal character and constitution. The features - cultural diversity, multivoicedness, dialogue, macro-level networks, networks of activity and boundary crossing - help us to analyse how different activity systems intersect and what 'travels' or may be exchanged between them (Gregory 2000). Part of adopting such an approach is also to see CHAT as referring not only to an historically and contextually framed inquiry, but one within which cross-cultural communication is important (for example, Cole 1988). Here what is needed is the integration of activity systems and elements of them in which language and expression, modes and discourse processes and the articulations of situated experience are central 'resources' in cross-cultural communicaton. Engeström has conceptualised this third, synthetic phase of CHAT in an expansive theory of learning (1987, 2001). He argues that we can identify five main principles: 1) The activity system as the unit of analysis; 2) multi-voicedness; 3) historicity; 4) contradictions; and 5) expansive transformations. In his model, Engeström outlines the following stages in cycles of transformation: 1) questioning existing practices; 2) analysing existing practices; 3) collaboratively building new models, concepts and artifacts for new practices; 4) examining and debating the created models, concepts and material and immaterial artifacts; 5) implementing these; 6) reflecting on and evaluating the process; and 7) consolidating the new practices. (Engeström 2001; Lipponen et al. 2004, p.35). For Engeström, learning is a state of becoming, that is for persons and institutions; it is unstable, ill-defined and often not yet understood. There is a transformative component to this theory in that we need to learn new forms of activity which are not yet crystallised, but are in the process of emergence. For Engeström (2001, p.139), "Expansive learning activity produces culturally new patterns of activity". These patterns need to be seen against the summative dimensions of the entire system just as learning needs to take place in interconnected, dynamic activity systems (see also Wells 1999). It is also important to study the background and context of these intersecting activity systems. Historicity is one of the main characteristics Engeström argues we need to include in a thorough model. In a southern African educational setting this is part of the daily enactment of understanding inherited structures and constraints as well as developing alternatives to evade, erase and replace them. Engeström also argues that we should add to this approach acknowledgement and analysis of contradictions which arise in overlapping relations and outcomes. Here disturbances, conflicts and challenges posed by intersecting systems need not be seen as negative; they are part of processes of negotiation and transformation. This he takes up in the final component of expansive transformations. When cycles of change are lengthy, individuals may begin to deviate from conventions and their individual secure practices and concepts. For Engeström (2001, p. 137), "An expansive transformation is accomplished when the object and motive of the activity are reconceptualised to embrace a radically wider horizon of possibilities than the previous mode of activity." In summary, in expansive cycles of learning, the activity system is transformed and along with it new motives and objects are generated (Lipponen et al. 2004, p.35). In this change process, actors in the activity system reflect on their own reconceptualisations of the system. They assess shared objects and relations. The actors "... negotiate a shared understanding of the new activities and artifacts, and in this process something new is created and emerges". Engeström (2001) positions his five principles of activity systems (unit of analysis, multi-voicedness, historicity, contradictions, cycles of expansion) against four questions in the shape of a matrix. The questions focus on the learners. The questions are: Who is learning? Why are they learning? What are they learning? And how are they learning? I now apply this framework to the three experimental, innovative projects in which Zimbabwean students were primary collaborative actors. This first case and unit of analysis centred on an existing ceramics course and learning about traditional pottery involving student collaborative and multi-voiced production of a hypermedia web with support from peer tutors. The case was developed in Zimbabwe, The software Storyspace was used as the main authoring tool. The resulting web was a hybrid of media types and discourse modes: print text, photographs and video; face-to-face and electronic interviews, on screen categorisations, a short narrative with drawings, and hyperlinking. The students developed work in the form of an hypermediated portfolio to which they each contributed and commented on shared inputs and one another's work (Morrison 1997). The overall research question behind this was: How might fine art higher education students in an African setting themselves collaboratively compose content-rich hypermediated learning resources where few formal documents and limited research are publicly available? On the why of learning , as one part of the overall HyperLand project, a web was developed to support learning about visual arts in Zimbabwe at the Department of Graphics and Fine Art at the Harare Polytechnic. Called HyperVision , this web contained a variety of art resources (writings, still images, video annotations of exhibitions) which were compiled with input from artists, critics and students. The contents of the HyperVision web are shown in Figure 1. Given the fact that since Independence in 1980 much art interpretative discourse has been written by white English-speaking Zimbabweans and European scholars (albeit sensitive to local context), the project also aimed to encourage students to see art criticism and visual literacy in cross-cultural perspectives (for example, Phillipson 1995; Messaris 1997).5 Local texts, images, gallery visits and video material were hyperlinked to produce a novel structure and a resource for expansive learning. The students' own expansive learning would contribute to this discourse, content-wise and rhetorically. Final-year ceramics students were asked to develop a hyperweb of their own to investigate the cultural context, design, uses and production processes of traditional pottery (Morrison 1997). They were asked to use a diversity of modes and media in shaping such a web as part of learning how to articulate their own learning multimediationally. This is indicated in the painting to the left in Figure 1 which was created by the students and used in the opening screen on the final version of the pottery project rather than a photograph of a pot. This shows that multi-voicedness may be seen not only as a written or spoken polyvocality but also as a mix of media types and modes of artistic expression. The motive of this web was also to build contextual resources around a specific domain of material culture and as material for a hypermediated interpretation. In terms of historicity, the pottery project aimed to develop situated, local knowledge resources alongside the students' own practice in pot-making and related interpretation. The web was intended to be a record of students' creation of a multimodal artifact rich in content, modes of communication and media types. Yet, it was also designed to provide them with experience in learning processes through cycles of transformation, in questioning their own practice in relation to existing ones, and reflecting on their own art making and analysis and the contradictions and new horizons arising from these. In terms of the who of learning , the group consisted of six students, five women and one man. They were all taking a course in ceramics and made use of the HyperVision web (used more generally in other classes), with guidance from specially trained peer tutors from the HyperLand project. Support importantly came from the head of department, Jane Shepherd, and her staff. At a macro-level network, the ceramics lecturer, Alison Brayshaw, saw a possible connection of the HyperVision web to her course in ceramics. Of British origin, she admitted she had little knowledge of the forms and functions of traditional Zimbabwean pottery. We discussed how a student-based hypermedia production might involve ceramics students in moulding more than just clay but in building an experimental web of material and reflection on traditional pottery. This would involve them in networks of activity with their aunts, grandmothers, a gallery director, an art lecturer, another ceramic lecturer and the four peer tutors involved in the HyperLand project. That pot-making along traditional lines is a female gendered activity also meant that gender was an ever present element. The one male student in the group found he was not only working with five motivated female colleagues, but that he had restricted access to the gendered transmission of knowledge on pot-making. He discussed this in a video file in which he mentioned his own understanding of the contradiction of being aksed to learn about embellishment and diverse styles and uses of pots while not having an inherited role from which to access such historical knowledge. Top left: video on value of tradition. Below: photograph of pots having been fired in the earth. Right: student drawing for section with their writing on Oral Traditions in conveying knowledge. On the what of learning, the students developed a novel and information-rich web in which they demonstrated their own work processes and results. Their web included written texts, summarised from the few print publications they were able to locate in libraries and the National Archives, but also written by them. There were tables categorising, naming and describing a range of pots and their functions. A hypermedia story was developed with illustrations by the students so as to show contexts of cultural use of pots. Special attention was given to the role of women in making pots and in their handing down of knowledge to novices. The project was patterned around the categories of Background, Usage, Process and Intepretation. The group learned that knowledge about traditional pots lay not only in books and their classroom. They visited their families in rural parts of the country and through interviews learned about the value of oral culture as a repository of knowledge. This was echoed in their own spoken contributions to the web. 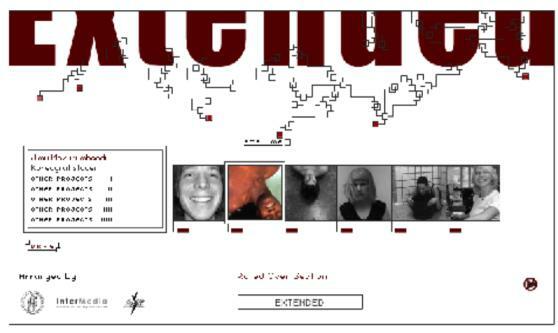 The project clearly introduced a range of voices and perspectives and the possible contradiction between oral culture and techno-determinism of a hypermedia system was avoided through the production of a synthetic text: the students all commented that the possibility of continually changing their inputs and links in the hypertext system meant that they were able to work through cycles of reflection and improvement of their contributions. The group also learned to work together collaboratively in contributing material to the dynamic structure they presented as work in progress and which was redesigned with help from the lecturer and researcher and educational designer. In terms of hypermedia, the students developed a multimodal text of their own, drawn to different modes of presentation and cross linking by virtue of the material they gathered. However, they were also able to use the functions in Storyspace and quickly alter how content was linked. They clearly demonstrated skill in how to think and link across factual content, narrative, photographic and hand drawn representations. Concerning the how of learning and historicity, these students were actively involved in meeting and translating their own cultural heritage and representing it as a digital, cultural one in a form of collage-like writing and imaging (Landow 1998). They were involved in conducting primary research, the documentation of field interviews, and the generation of new textual representations. They did this with support from their lecturer with her background in education as well as from the researcher-designer and the three peer tutors in the HyperLand project. The students also consulted other lecturers in the department and, most challengingly, in terms of Engeström's conflictual questioning and 'multi-voicedness ' and 'dialogue', gave a diskette with interview questions to one lecturer who had designed a series of postage stamps on Zimbabwean pottery. The students asked her to give an account of her own knowledge making on Zimbabwean pottery. The lecturer's replies were included in the web. The students also included the earlier photographic documentation by one of their lecturers of traditional methods and contexts of production (from shaping to firing). The students made their own voices heard through short videos. They used these to annotate their contributions to the web and also to reflect on it. For example, the male student reflected on how he had learned more about the value of women as bearers of cultural and artistic knowledge through researching gender in pot-making; this video could be seen alongside those by the women students As part of composing their web, the students had several sessions in the networked computer lab at the University of Zimbabwe. Here they were able to work collaboratively in structuring, linking and annotating their material. In terms of multiple activity systems, this student project was also incorporated in the many sessions on the broader HyperLand project for students in the Humanities at the university. This student work was an example of "rearticulating hypertext writing" (Johnson-Eilola 1997) that would break out of known modes of formal project presentation in the art institution as well as by extending notions of hypertext writing to multimodal 'composition'. Further, as a 'translation', this student project took a multimedia tool and used it to articulate new views on gaps in the small body of print sources. It augmented these through short accounts of field visits, via individual entries, through the narrative piece which waslinked to a formal typology of pottery artifacts and in video meta-reflections on the process included as guides to other users. Gender perspectives on the gendered activity of pot-making were also linked in the model of expansive learning to another web developed by law students on women's rights to land, inheritance questions and connections to a women and law research project. This too reached into a different activity system in which women law students were co-designers of a learning task for their large class of peers on learning how to generate a genre of written legal discourse. In reading th epottery projec tin terms of metamedia literacy (Lemke 1998), the students all commented favourably that the experience had given them insight into their own cultural heritage, into how to use digital media as a research and recording tool for reflection, into new ways of understanding visual arts as multiply constructed discourses and especially into the role of women as bearers of traditional culture. This was clearly to move beyond the "hype over hypertext" (Snyder 1998). As an educator and researcher interested in the transformative aspects of an activity theoretical approach to socio-cultural learning, the project most clearly was a case, in Engeström's words, of developing "a wider horizon of possibilities". One of the students, Victor Mavidzenge, expressed this as follows: "I don't think I'd be seeing as far as I do now. It was really inspirational. It's hard to express how much it did for me because you know words are very limiting, but the innermost feelings are what counts as I see it. So it was more like a new door opening to me you know, so I don't think I'd be thinking like I do now (laughs)." In terms of 'boundary crossing', the pottery web included a variety of successful use of modes and media (video, drawing, interviews). These were positioned in an integrated articulation of making and interpretation which broke out of the predominantly art-making pedagogical frame for the institution. Students' own prototypical and hypermediated discourse illustrated how collaborative, peer-based authorship might be achieved through creative processes and in buildingcontent along with situated interpretation. As expansive learning, the pottery project may be seen as an instance of the collaborative design of a new activity. The case offers empirical evidence of how the conceptual frames of of CHAT may be anchored in actual production and reflection on learning. Students' own experimental production generated a newly textured body of work. The means and content of this work was embodied in a new mediating artifact. Figure 3: The integrated interface in BallectroWeb. 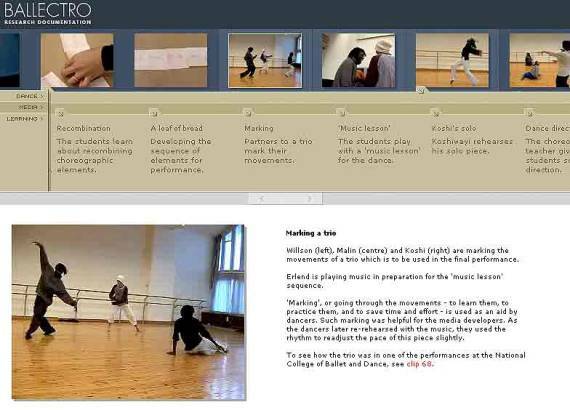 Top: an item on rehearsing a trio is selected from one of 80 videos in a horizontal scrollable video menu. The video plays in the large window (bottom left.) One of three tracks (dance, media, learning) has been selected from the bar below the video menu; a corresponding text appears to the right. The large video window has controls built in (pause, frame-by-frame moves etc). The main research question was: In what ways might the inclusion of digital technologies impact on the compositional processes and outcomes of collaboratively developed choreography for dance performance? The changing horizon of possibilities inthe model of expansive learning was enacted through collaboration on dance making in which digital media was to be a partner. In expressive digital arts and culture in which performance and performativity are themselves being reconstituted (for example, Birringer 1998; Schieffelin 1998), new modes of public expression and screen based mediations are beginning to be documented (for example, deLahunta 2002). This project involved participants in collaborative design processes based on methods from the performing arts but also from experimental digital media production (for example, Halskov Madsen 2003) and iterative design. The merger of real-time and recorded mediations of both dance and digital media may result in a different, hybrid digital poetics (Qvortrup 2003). As Seaman (2002) argues, it is the potential and practice of the recombination of elements in such a poetics which challenges us to see perfomativity differently. This is a performativity in which the relationships between human performer and media-as-actor alter earlier notions and expectations of stage and staging (Sparacino et al. 2000). These are environments which are labelled mixed or augmented reality and extended to media as responsive participants through sensors and location aware technologies (for example, Sha & Kuzmanovic 2000). In our setting, and given that this was our first foray into such a project, we would concentrate on computer-based and live projection and multiple screens as the main means of creating an extended stage and staging. On the who of learning , the Ballectro project was a collaboration between six final-year choreography students at the National College of Dance in Oslo and InterMedia. Two of these students were financed on a collaborative study programme between Norway and Zimbabwe. There were three male dancer-choreographers in this group, two of whom were from Harare. The group was taught by a freelance choreographer and dancer as well as by three media researcher-designers from InterMedia at the University of Oslo. The aim of this partnering with the College was originally to provide some video-based documentation of dance performance. However, in practice, this collaboration was quickly extended to a shared process of designing, learning and performing a dance work over one semester. On the what of learning , the student and development group learned about the complex and recursive possibilities in developing a dance performance work in which digital media elements could be included and at different levels of centrality in a final performance. They saw how improvisation with video feedback could generate ideas for designing movement. Such aspects were included in the final performances. Further examples of the what of learning as process and as product, can be seen in the project website. The students learned about the cycles of transformation in the varied intersections between digital music, animations in the software Flash, and their dancing with live projected images of themselves (for example, see Figure 4). The videos in the website show, for example, links between rehearsals and final performance material by Koshiwayi Sabuneti form Zimbabwe. Figure 4: Ballectro . Live video projection of Willson Phiri from an ensemble with two dancers. About the how of learning , the project explicitly faced a number of potential contradictions on learning and performance design as process. These centred on the negotiation of real-time, recorded dance and media and their intersections as mixed or augmented reality performance. Here students were working with new modes of interconnecting composition. We used workshopping sessions, with improvisation of both dance and media. One of the contradictions we quickly encountered was that dance students were able to turn on their heels and rework movements while it took more than a few hours to change some of the digital media elements. Initially, the dance students were impatient; however, they came to understand that other than the immediate and playful character of video feedback, digital scenography takes time both to generate and to re-design. The 'composition' went through many cycles and reordering of elements. At first, some of the students commented that this was confusing; towards the end of the experience, Willson Phiri from Zimbabwe commented that this was a completely different way of learning to dance and to choreograph: improvisation and expressivity were not necessarily centred around a musical score as has been the approach in most of the choreographers' educationThe website demonstrates the variety and cycles of process driven creativity. In addition, and especially for the Zimbabwean students, the choreography teacher herself was open to exploring alternative solutions and framings of parts of the dance piece. They were able to see a choreographer at work with experimental media and see how a recombinatorial design process could bear fruit. Further, these students could extend their experience from that of their traditional classes at their own dance school to include collaborating with researcher-designers at an educational research and experimental media lab. This was similar to Engeström's concept of change laboratory. The multi-level composition Ballectro functioned as a mirroring device for the participants: where different elements were known to different participants, it was the combination of these and the interplay between them that resulted in a new activity or unseen horizon of possible expression. Through this activity it was also possible to refract the main concepts back to the whole group, not always in a strict activity theory vocabulary, but through discussions on problems and potential of mediated dance and its shared design or composition. 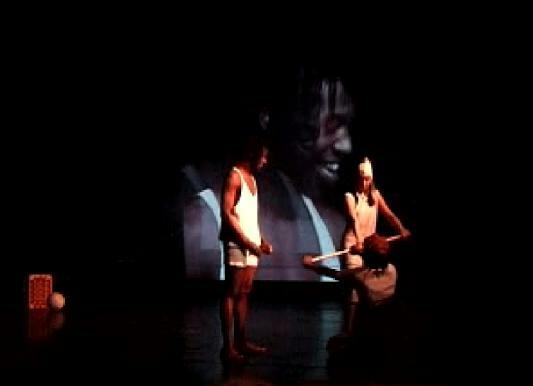 In terms of border crossing and multimodal composition, the integrated performance work included 'traditional' Zimbabwean dance blended with 'contemporary' western dance movement, accompanied by animations in Flash. Traditional Zimbabwean mbira music was played live, but also remixed electronically in collaboration with material by a young Norwegian electronic musician. In summary, these multimodal compositional elements were also combined, with the overall result that the students developing a new, integrated activity in and through which their own blends of knowledge and cultural expression were realised. Figure 5: Startscreen of student initated and designed website developed in Flash for Extended , with term papers containing video of projects and of Ngirozi. In the third case, Extended, the interplay between media and dance shifted to one between choreography and media students in Oslo (see Figure 5). In this partnering, four works were developed, each an experiment in collaborative learning and hybrid performativity. Media and dancers were active contributors to an overall creative co-construction. One work, Ngirozi, by the Zimbabwean participant Jimu Makurumbandi, is presented in detail here (Figure 6). This was a narrative piece with a mix of southern African dance styles (Morrison 2003b). The overall research question was: What issues of cross-cultural communication emerge in the development of digital sceneography for narrative-led dance performance work? Figure 6: Stills from Ngirozi . On the left, digital scenography fills the right hand side of the image; to the right, the dancer in full motion is pictured in a still from a digital camera. Concerning the who of learning, this was a second choreography project between the National College of Dance and InterMedia. This time, however, the four dance students involved were choreographers and they did not themselves necessarily need to dance their works. In contrast with the Ballectro project, the media elements of these works were designed, developed and performed by two masters students in Media and Communication at the University of Oslo. 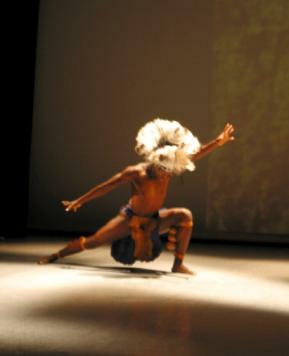 In the case of Ngirozi, the choreographer Makurumbandi chose also to dance his work. This involved the participants in unique relationships not present elsewhere in the project. On the why of learning, the concept 'extended' was introduced to challenge both choreography and media students to rethink their notions of performativity and to find ways of reaching beyond their given experience and competencies by way of collaboration. For the choreography students this was to think creatively about how the body and movement might be extended performatively. For the media students, who were taking a course in new media production and critique, the aim was to investigate how digital media as scenographycould be integrated as part of the overall composition. In the student developed website, shown in Figure 5, the students listed the following questions as part of their process of defining their joint creative experimentation: What is integration? Where does the physical room end? Can it be extended into a virtual one? Is there an overlap between the rooms? If so, what happens to the dancer? Is the extended body within reach? What is digital scenography? How can we use it? The students were explicitly asked to face one of the main contradictions experienced in the Ballectro project, namely that the choreographers' design took primacy over the media. In this new project, the aim was to find out how movement, space, body and media could complement and play off one another. This was to give the students a difficult challenge in developing not only their own blended and collaborative learning experience; it was to ask that they achieve this artistically and for live performance.7 Here, with little work published on digital scenography (for example, Morrison et al. 2004), the students needed to draw on their own ingenuity in devising, workshopping and reformulating dance and digital media as composition and simulation (see for example, Penny 2004). As researchers, we have attempted to analyse their works and to develop further the concept of performativity. 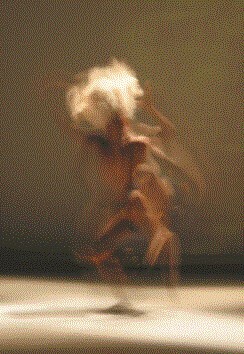 On the what of learning , Jimu Makurumbandi chose to design and dance his work as a solo (see Figure 8). He was the only student who was not Norwegian and also a male choreographer. He wanted to develop a work which would be an invocation of ancestral spirits in the setting of a cave. This led to discussion about how to create a cave-like scenography in which animated figures would dance on the rockface as backdrop as the dancer himself moved through the space and into such projections. This raised many questions about the ethics and aesthetics of such mediations. The Norwegian media students were requested not to produce hackneyed images of San rock paintings which would be at odds with the views and cultural understanding of their co-developer. Thowever, the students were asked to not merely reproduce images from key print texts on San rock painting in the region. Inn time, they developed a short dance work together in which a small screen was placed at the front of the stage to demarcate two different narrative zones in the choreographed movement. Pixellated animations were projected of shadowy figures moving on the rock face. The choreographer reflected positively on his own learning through such co-ordinated activity in desinging and in performing. In particular, as the dancer in the piece, he also felt connected to the animated figures dancing on his body (Morrison 2003b). Figure 7: Reworked scenography for Ngirozi with altered colour palette and increased scale of animated figures as presented in the project Extended+. On the how of learning, in addition to the same modes of improvisation, sketching, and workshopping collaboratively, the media students also came with pre-prepared scenography for discussion and adaption. There were compromises on the depiction of the cave and the character of the animated figures. Despite the openness to experiment on the part of this Zimbabwean choreographer who had not worked with digital project and blended movement with digital scenography, we encountered a substantial contradiction in terms of activity theory. In CHAT, analysing contradictions is important so as to identify changes which might be needed and the processes involved in effecting them. 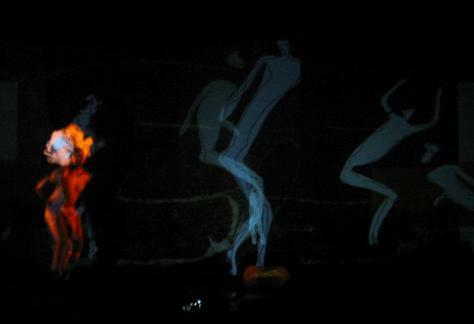 The contradiction was that, despite being visible on the computer screen, the main animated figures were not easy for audiences to see when the stage was lit and when the projection was itself a major source of light. Although the dancer commented that he saw new relations and dimensions to his performance because he almost felt the figures dancing on his skin, audiences did not have this experience in the way this was intended. In developing this scenography, the media students had had to pay attention to four dance works in all; perhaps they had also been too careful about in avoiding the clichéd literalism of uses of San rock paintings in advertising. As a consequence the figures which were developed were not distinct enough, nor was there adequate contrast in their projection onto the dancer. This led us to all to reconsider the entire scenography as a tension, in Engeström's terms, in need of resoultion. The Extended project produced four new digitally mediated dance works. For undergraduate choreography students it provided an opportunity to work with fellow media studies Master's level students and learn about ways of seeing performance as more than driven by dancers. In this new activity, the media students also came to see how to design moving media as part of dynamic performance. For the Zimbabwean student, this was his first engagement with digital scenography as part of artistic and cultural expression. However, as this scenography was at times difficult to see, we discussed ways to adapt it in a new cycle. This was taken up in a project on multimodal discourse and augmented space. We called this redesign of the digital scenography and the performance work Extended+. As can be seen in Figure 7, the earlier sepia and ochre tones have been replaced by figures much more visible and all-the-more-so on the dancer's moving body (Morrison et al. 2004).8 For us, this reworking was a clear example of an expansive learning cyle and a shift from a student to a professional production, one in which similar collaborative workshopping methods were used. Makurumbandi has also been able to include this work in his emerging portfolio and as part of his experimental repertoire in new choreographies with Zimbabwean dancers. Ultimately the projects into extended dance and mediated performance showed that in terms of intersecting activity systems, choreographic and scenographic design cannot be effectively developed as separate entities. They need to be understood as embedded in a complex of negotiations between the kinetics of dance design and the dynamics of shaping digital scenography. Information communication technologies are now apparent at different levels of complexity and use in many higher education institutions. In the arts, working out ways in which ICTs can be applied to articulate educational needs and give shape to cultural expression is as much a part of finding apposite means of articulation as it is learning how to compose through multiple media types, software applications and underlying information systems. Each of the three cases presented above indicates how ICTs have been taken up in processes of meaning-in-the-making. It is this making that transverses the cases. Through exploratory and student-generated production, new knowledge, fresh mediating artifacts and intersectinig activity systems were generated. This generative aspect of learning through production included important open-ended tasks where student collaboration was built as and through 'dialogue' with existing knowledge and via the emergence and related synthesis of new knowledge for the participants. This transformation was facilitated through processes of improvising, devising, and trialling the intersections of artistic expressions, digital technologies and multiple participants. The initial open-ended nature of these activities placed high demands on students' engagement with negotiating digital technologies in shaping their creative expression. The resulting works indicate the importance of interdisciplinary collaboration in shared creative processes where technologies have an role as compositional and performative 'actors' as is argued by actor network theory. However, in these three cases relating to Zimbabwe, the participants working with new software and media types (hypertext and video) and in cross-border collaboration (between media studies and choreography) generated new cultural resources, knowledge-through-use and art and performance works. In terms of border crossings and multimodal composition, these matter at the level of cultural significance, that is as cultural articulations, digitally composed and mediated. These three projects demonstrate that the theory and model of expansive learning provides a useful frame for understanding the emergence of digitally mediated communication in higher education relating to the southern African region. Students' roles in acquiring individual literacy knowledge and practices may be seen in their productions and reflections on them in a cd-rom web, in a project-based website, via a student website and through live performance with mediated scenography. Art and choreography students' participation in co-constructing new knowledge about content and fine arts and modes of performing is crucial in the building of a fuller understanding about multimodal composition. Hall (1996b, p.247) also argues that we need to engage in a reading of a double inscription of difference. He foresees that the value of post-colonial studies "lies precisely in its refusal of this 'here' and 'there', 'then' and 'now', 'home' and 'abroad' perspective". For Hall, the global should be seen neither as universal nor as nation/society specific. What is important is how "the global/local reciprocally re-organise and re-shape one another". This may be connected to the concerns of third generation CHAT and the approach of expansive learning. Key concepts of cultural diversity, multivoicedness, dialogue, macro-level networks, networks of activity and boundary crossing have been shown to be present in intersecting activity systems concerning a dynamics of learning how to apply ICTs in fine and performing arts. The Hyperland project was supported by the Linguistics Department and the Media Programme at the University of Zimbabwe, and by the Department of Media and Communication, University of Oslo and NUFU. The Ballectro and Extended projects were made possible through grants from the Faculty of Education at the University of Oslo. Extended+ was part of the MULTIMO project (Researching Multimodal Discourses) financed by the KIM programme, Research Council of Norway. Thanks to Sten Ludvigsen, Sinfree Makoni, Even Westvang and Synne Skjulstad for their comments; my thanks also to the many participants in these projects. 1 The first case is from 1996, the second from 2001 and the third from 2004. 2 The article does not present a detailed interaction analysis of processes of negotation and breakdown. It is concerned with accounting for how transformation in learning may be understood as a multi-level, shared activity. 3 I draw this term from the work of Gregory Ulmer (e.g. 1998). I refer you to his website for further details and to Morrison (2001). 4 Engeström (2001) has described activity theory as passing through three phases, culminating in multiple activity systems. In the first phase, centred on Vygotsky, relationships were posed around subject-object-medation relations. In the second phase, influenced by Leont'ev, differentiation between individual and collective action was made. The third phase now ushers in concern with multiple, interrelated activity systems. In this third phase, Engeström (2001, p.135) suggests we need to develop concepts and tools to account for dialogue, multiple perspectives and networks of these intersecting systems. Boundary crossings occur when the outcomes of these systems overlap. For Engeström (2001, p.139) the learning challenge therefore "is to acquire new ways of working collaboratively". 5 Later in the decade in the region there appeared vibrant, challenging publications on interpretation, visual arts and identity (for example, Deepwell 1997; Enwezor 1997). 6 As media and education researchers involved in this co-design, we have published several print pieces on this project (for example, Skjulstad et al. 2002). We have also attempted to communicate the project online in the form of a seminar presentation (Morrison et al. 2001) linked with an actual performance and a website, the BallectroWeb. This website is a resource for contextualising the project especially via video (see Figure 5). It links research publications to contexts of production and performance-based learning. I encourage readers to refer to the site themselves. Its interface allows users to trace comments on the videos from three perspectives, while at the same time scrolling across the menu of videos. This website has been invaluable in explaining such inquiry as exhibition, as performance and as creative co-construction. This has referred to not only dance design and performance but as the role of dynamic software and media in generating movement in the interface (Skjulstad & Morrison 2005). 7 In doing this we were also concerned as researchers to see how production-based learning and collaborating in a production and a performance could raise new issues and perspectives for critical theory and new media (Bolter 2003). 8 This scenography was developed by one of the original media researchers in the Ballectro and Extended projects, Synne Skjulstad, and one of the media students from Extended , Idunn Sem. Jimu Makurumbandi was again central to this process, and in his own words this was part of a reshaping of possibilties and expression, or in expansive learning frame, a clear cycle of expansion which came about through designing, via interative changes and in performance. The resulting redesigned scenography was performed three times in a choreography festival in Spain. 9 See e.g. Sylvester (1999) for discussion of linkages between development studies and postcolonial studies, with reference to Zimbabwe. 10 If we take the second sense of development to refer to ICTs in development-oriented institutions and societies, we find that development discourses are framed by terms such as the digital divide, technology transfer and the transformative power of ICTs to overcome fundamental and embedded development needs. In such settings, ICTs have often been directed towards the material sciences. In such targeted investment, technologies have been perceived drivers of wider economic change. In contrast, one seldom comes across research papers about creating, teaching or researching electronic arts relating to African contexts and cultures. It is perhaps even less often that these perspectives on electronic arts travel 'north' and have a presence there in negotations of learning with and through digital tools and modes of composition and reflection. Atkinson, B. & Breitz, C. (eds.) (1999), Grey Areas: representation, identity and politics in contemporary South African art, Chalkham Hill Press, Johannesburg. Birringer, J. (1998), Media & Performance, Johns Hopkins, Baltimore. Bolter, J. (1998), "Hypertext and the question of visual literacy", In Reinking, D., McKenna. M., Labbo, L. & Kieffer, R. (eds. ), Handbook of Literacy and Technology: transformations in a post-typographic world , Lawrence Erlbaum, Mahwah, pp. 3-13. Bolter, J. (2003), Critical theory and the challenge of new media. In M. Hocks & M. Kendrick (eds.) Eloquent Images, The MIT Press, Cambridge, pp.19-36. Buckingham, D., Grahame, J., & Sefton-Green, J. (1995), Making Media: Practical production in media education, The English and Media Centre, London. Buckingham, D. & Sefton-Green, J. (1997), Multimedia education: Media literacy in the age of digital culture. In R. Kubey (ed.) Media Literacy in the Information Age, Transaction Publishers, New Brunswick, pp. 285-305. Chambers, I. & Curti, L. (1996), (Eds. ), Common Skies, Divided Horizons, Routledge, London. Cohen, A. (1999), (ed. ), Signifying Identities, Routledge, London. Cole, M. (1988), "Cross-cultural research in the sociohistorical tradition", Human Development, vol.31, pp.137-151. deLahunta, S . (2002), "Virtual reality and performance", Performing Arts Journal , vol.70, pp.105-114. Deepwell, K. (1997), Introduction. In K. Deepwell (ed.) Art Criticism and Africa , Saffron Books, London, pp.9-13. Díaz-Kommonen, L. (2002), Art, Fact and Artifact Production , University of Art and Design, Helsinki. Diaz-Kommonen, L. (2003), "Expressive artifacts and artifacts of expression", Working Papers in Arts and Design, vol.3. Available at: http://www.herts.ac.uk/artdes1/research/papers/wpades/vol3/ldkfull.html. Engeström, Y. (1987), Learning by Expanding: An activity theoretical approach to developmental research, Orienta-Konsultit, Helsinki. Engeström, Y. (1999a), "Activity theory and individual and social transformation", In Engeström, Y., Miettenen, R. & Punamäki, R. (eds. ), Perspectives on Activity Theory , CUP, Cambridge, pp.19-38. Engeström, Y. (1999b), "Innovative learning in work teams: analysing cycles of knowledge creation and practice", In Engeström, Y., Miettenen, R. & Punamäki, R-L. (eds. ), Perspectives on Activity Theory , Cambridge, CUP, pp.377-404. Engeström, Y. and Miettenen, R. (1999), "Introduction", In Engeström, Y., Miettenen, R. & Punamäki, R-L. (eds. ), Perspectives on Activity Theory, Cambridge, CUP, pp.1-16. Engeström, Y. (2001). "Expansive learning at work: toward and activity theoretical reconceptualisation", Journal of Education and Work, vol.14, no.1, pp.133-156. Engeström, Y. (2004). 'New forms of leanring in co-configuration work', Journal of Workplace Learning , vol.16, no.1/2, pp.11-21. Enwezor, O. 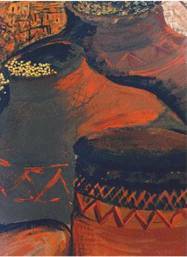 (1997), Reframing the black subject: ideology and fantasy in contemporary South African art. In M. Hope (ed.) Contemporary Art from South Africa. Exhibition catalogue, Riksutstillinger, Oslo, 20-36. Greene, M. (1995), Releasing the Imagination: Essays on education, the arts and social change , Jossey-Bass, San Francisco. Gregory, J. (2000), Activity theory in a 'trading zone' for design research and practice. In D. Durling & K. Friedman (eds.) Proceedings of Doctoral Education in Design: Foundations for the Future , International conference, La Clusaz, France, 9-12 July, Staffordshire, UK, Staffordshire University Press. Available at: http://heim.ifi.uio.no/~judithg/. Haas, C. & Neuwirth, C. (1994), Writing the technology that writes us: Research on literacy and the shape of technology. In C. Selfe & S. Hilligoss (eds.) Literacy and Computers: The complications of teaching and learning with technology, The Modern Language Association of America, New York, pp.305-315. Hall, S. (1996), When was the 'post-colonial'? Thinking at the limit. In I. Chambers & L. Curti (eds.) Common Skies, Divided Horizons, Routledge, London, pp. 242-260. Halliday, M. (1996), Literacy and linguistics: A functional perspective. In R. Hasan & G. Williams (eds.) Literacy in Society, Addison Wesley Longman, Harlow, pp. 339-376. Halliday, M. & Hasan, R. (1985), Language, Context and Text: Aspects of language in a social-semiotic perspective, Deakin University Press, Geelong. Halskov Madsen, K. (ed.) (2003), Production Methods: Behind the scenes of virtual inhabited 3D worlds , London, Springer. Johns, A. (1997), Text, Role, and Context: developing academic literacies , CUP, Cambridge. Johnson-Eilola, J. (1997), Nostalgic Angels: Rearticulating Hypertext Writing, Ablex Publishing Corporation, Norwood New Jersey. Johnson-Eilola, J. (1998), Negative space: from production to connection in composition. In R. Taylor & E. Ward (eds.) Literacy Theory in the Age of the Internet, Columbia University Press, New York, pp.17-33. Kress, G. (1998), Visual and verbal modes of representation in electronically mediated communication: The potentials of new forms of text. In I. Snyder (ed.) Page to Screen , Routledge, New York, pp.53-79. Kress, G. (2003), Literacy in the New Media Age, London, Routledge. Kress, G. & van Leeuwen, T. (2001), Multimodal Discourse, Arnold, London. Landow, G. (1998), Hypertext as collage-like writing. In P. Lunenfeld (ed.) The Digital Dialectic: New essays on new media, The MIT Press, Cambridge MA, pp.150-170. Lave, J. & Wenger, E. (1991), Situated Learning: legitimate peripheral participation, CUP, Cambridge. Lemke, J. (1998), Metamedia literacy: transforming meanings and media. In D. Reinking, M McKenna, L. Labbo & R. Kieffer (eds.) Handbook of Literacy and Technology: Transformations in a post-typographic world , Lawrence Erlbaum, Mahwah, pp.283-301. Lipponen, L., Hakkarainen, K. & Paavola, S. (2004), Practices and orientations of CSCL. In J. Strijbos, P. Kirschner & R. Martens (eds.) What we know about CSCL and implementing it in higher education , Klewer, Boston, pp.31-50. Manovich, L. (2003), The poetics of augmented space. In A. Everett & C. Caldwell (eds. ), New Media: Theories and Practices of Digital Textuality , Routledge, New York, pp.75-92. MacIntyre, B., Bolter, J., Moreno, E. & Hannigan, B. (2001), "Augmented reality as a new media experience", ISAR 2001, New York, NY, October 29-30. Available at: http://www.cc.gatech.edu/projects/ael/papers/newmedia.html. Messaris, P. (1997), Visual 'literacy' in cross-cultural perspective. In R. Kubey (ed.) Media Literacy in the Information Age, Transaction Publishers, New Brunswick, pp. 135-162. Morrison, A. (1997), "What happens when you let go? ", KTK seminar manuscript series on Communication, Technology & Culture, University of Oslo, no.6, pp.1-14pp. Available at: http://www.ktk.uio.no/notater/notat6.html. Morrison, A. (2001), Electracies: Investigating transitions in digital discourses and multimedia pedagogies in higher education. Case studies in academic communication from Zimbabwe , Doctoral dissertation, Department of Media & Communication, University of Oslo. Selected chapters available at: www.media.uio.no/personer/morrison.electracies/selchs.html. Morrison, A. (2003a), From oracy to electracies: Hypernarrative, place and multimodal discourses in learning. In G. Liestol, A. Morrison & T. Rasmussen (eds.) Digital Media Revisited, The MIT Press, Boston, pp.115-154. Morrison, A. (2003b), " Dancing with postcolonial theory: Digital scenography and the performance of local culture", Norsk medietidsskrift, vol.10, no.2, pp.28-56. Available at: http://www.medieforskerlaget.no/nmt_arkiv/2003-02/index.htm. Morrison, A., Skjulstad, S, & Smørdal, O. (2004), "Choreographing augmented space", Paper presented at FutureGround Conference, Melbourne, 17-21 November, (to appear in Proceedings 2005). Myers, J., Hammett, R., & McKillop, A. (1998), Opportunities for critical literacy and pedagogy in student-authored hypermedia. In D. Reinking, M. McKenna, L. Labbo & R. Kieffer. (eds.) Handbook of Literacy and Technology: Transformations in a post-typographic world, Lawrence Erlbaum, Mahwah, pp. 63-78. New London Group, (2000), A pedagogy of multiliteracies: designing social futures. In B.Cope & M. Kalantzis (eds.) Multiliteracies: literacy learning and the design of social futures, Routledge, London, pp.9-37. Penny, S. (2004), Representation, enaction, and the ethics of simulation. In N. Wardrip-Fruin & P. Harrigan (eds.) First Person: New media as story, performance, and game, MIT Press, Cambridge, pp.73-84. Phillipson, M. (1995), Managing 'tradition': The plight of aesthetic practices and their analysis in a technoscientific culture. In C. Jenks (ed.) Visual Culture , Routledge, London, pp.202-217. Qvortrup, L. (2003), Digital poetics: The poetical potentials of projection and interaction. In G. Liestøl, A. Morrison & T. Rasmussen (eds.) Digital Media Revisited: New media methods and theories, Cambridge, The MIT Press, pp.239-261. Seaman, B. (2002), Recombinant poetics: emergent explorations of digital divide in virtual space. In M. Resier & A. Zapp (eds.) New Screen Media , BFI, London, pp.237-255. Schieffelin, E. (1998), Problematising performance. In F. Hughes-Freeland (ed.) Ritual, Performance, Media, London, Routledge, pp.184-207. Sha, X. & Kuzmanovic, M. (2000), "From representation to performance: Responsive public space", DIAC 2000 , 20-23 May. Available at: http://www.f0.am/publications/2000_diac/index.html. Skjulstad, S. & Morrison, A. (forthcoming 2005), "Movement in the interface", Computers and Composition, vol.22, no.4. Skjulstad S, Morrison, A., & Aaberge, A. (2002), Researching performance, performing research: dance, multimedia and learning. In A. Morrison (ed.) Researching ICTs in Context, Intermedia/UniPub, Oslo, pp. 211-248. PDF available at: http://www.intermedia.uio.no/konferanser/skikt-02/skikt-research-conferance.html. Snyder, I. (1998), Beyond the hype: Reassessing hypertext. In I. Snyder (ed.) Page to Screen: Taking literacy into the electronic era, Routledge, London, pp.125-143. Sparacino, F., Davenport, G., & Pentland, A. (2000), "Media in performance: Interactive spaces for dance, theatre, circus, and museum exhibits", Systems Journal, vol.39, nos. 3 & 4. Available at: http://xenia.media.mit.edu/~flavia/publications.html. Sylvester, C. (1999), "Development studies and postcolonial studies: disparate tales of the 'Third World'", Third World Quarterly, vol.20, no.4, pp.703-721. Ulmer, G. (1997), "The grammatology of distance learning", TEXT Technology, vol.7, no.3, pp.5-20. Ulmer, G. (1998), Foreword/forward (into electracy). In T. Taylor & E. Ward (eds.) Literacy Theory in the Age of the Internet, New York, Columbia University Press, pp.ix-xiii. Vygotsky, L. (1962), Thought and Language , MIT Press, Cambridge. Vygotsky, L. (1978), Mind in Society: The development of higher psychological processes, Harvard University Press, Cambridge. Wells, G. (1999), Dialogic inquiry: Toward a sociocultural practice and theory of education, Cambridge University Press, Cambridge. Wertsch, J. (1991), Voices of the mind. A sociocultural approach to mediated action, Harvard University Press, Cambridge. Wertsch, J. (1995), The need for action in sociocultural research. In J. Wertsch, P. Del Río & A. Alvarez (eds.) Sociocultural Studies of Mind, Cambridge University Press, Cambridge, pp.56-74. Wertsch, J. (1998), Mind as Action , Oxford University Press, Oxford. Wysocki, A. & Johnson-Eilola, J. (1999), Blinded by the letter: Why are we using literacy as a metaphor for everything else? In G. Hawisher & C. Selfe, C. (eds.) Passions, Pedagogies and 21st Century Technologies, Utah State University Press, Logan, pp.349-368. Wysocki, A. (2004), "Opening new media to writing: openings and justification", In Wysocki, A. Johnsosn-Eilola, J., Self, C. & Sirc; J. Writing New Media , Utah State University Press, Logan, pp.1-23.